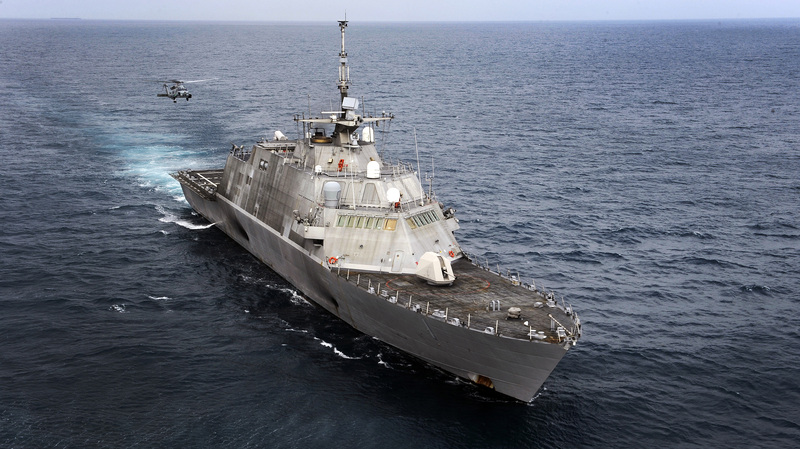 Freedom, the first littoral combat ship, has been in service for only two and a half years. But it’s lost that new ship shine. Exhaust blackens the superstructure and the hull in this photo, taken June 7 while Freedom landed a helicopter as part of a joint maritime exercise. More exhaust is visible spewing from the stack. Not to worry. In 2 more months, the replacement for LCS-1 will be underway in Lake Michigan for sea trials: LCS-3 USS FORT WORTH will depart the GReat Lakes just before the winter ice pack sets in. And within the next 18 months or so, LCS 3 will have have completed her various yard periods in NORVA and SDIEGO, and she will then stand up, and be ready to replace the old LCS-1, which can then be retired after proudly serving our country for over a 50th of a century. I think in the old days, this problem was dealt with by making the stacks higher. But the Navy may not want to do that with the LCS if that would increase it’s radar signature. Of course, that’s speculation. If I knew, I couldn’t tell you. I’m going to make an educated guess and say the reason why the exhaust is down so low is because of top hamper…There’s already a lot of the ship out of the water, and if her center of gravity is too high she’d be in peril from rolling. The new CNO can and should stop this insanity. No more LCS.